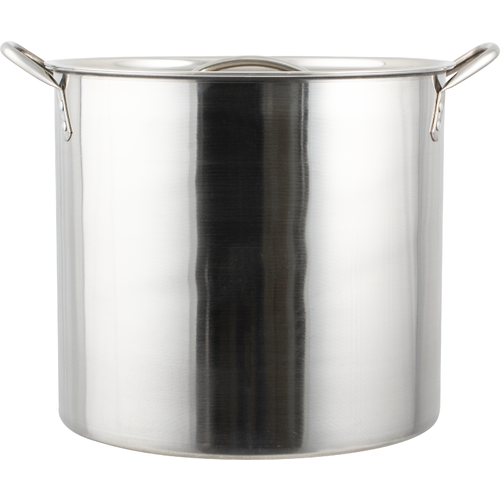 Smaller home brews should still produce results that are just as tasty as larger batches, which is why this 5 Gallon Stainless Steel Kettle is an excellent addition to your home brew setup. This small 5 gallon brewing kettle is a great kettle for the beginning brewer to learn on, as it holds a manageable sized batch and it’s available for a very affordable price. Although this brew kettle is quite economical, it’s also made of high quality stainless steel that is anything but cheap. The 0.5-mm thick sides and bottom are more than thick enough for this amount of liquid, and the riveted stainless steel handles on the kettle’s body make it easy to carry even when filled. This 5 gallon kettle can safely hold up to 3 gallons of wort while boiling, making it the perfect size for extract brewing right in your own home! For use in decoction mashing. For the price this kettle does everything i want for partial volume boils for 5 gallon extract brewing. The material is thin, and the lid is flimsy, but it holds up enough to do the job for the past 5 batches that I've used it for. I recommend for anyone on a budget like myself. If i had more money i would get a bigger and better quality kettle. save your money... buy a better brand. The handle came off after 2 uses. I love this kettle! I had been using an enameled kettle but noticed that the enamel had cracks and imperfections, so I decided to switch to this one. I have made five beers with this new kettle and am very satisfied with the results. It is a really good pan for the price but it doesn?t have an entirely flat bottom. There is a rim (of sorts) around the outside edge of the pan bottom that prevents the majority of the bottom of the pan from contacting my flat, glass-top heating surface. Hence, it takes forever to get to even a gentle boil and it?s difficult to maintain once I finally get it there. It?d be great on an outside burner, but New England winters can make that a bit tough. This was going to be my indoor solution for getting through the cold season, but I will be searching for another pan instead. Again, great for an outdoor burner but not for a flat/glass-top stove. I use a 10 gallon kettle as my HLT and boiling kettle. This 5 gallon kettle holds the runoffs from my mash tun. The kettle itself is very thin but serves my purposes well. if you want to brew properly then your gonna have to go with a stainless kettle. Works great for extract kits and has lasted a long time. Easy to clean. Excellent kettle for the price! For the price, this is a wonderful kettle. I've brewed over a dozen home brews in it and am very happy with how it's held up. Before I bought this kettle I shopped around and couldn't find a cheaper stainless steel option. I dream of buying a better kettle in the future, but for what morebeer charges, this is an ecellent value. I bought one of these when it was featured as a deal of the day. It's basically what you'd expect at this price point. It works great to heat strike/sparge water, which is what I bought it for. Mine arrived with a dent, but Morebeer sent a replacement out to me quickly. If you just need a cheap kettle, this will do the job. I'll be using this kettle for my HLT, so it should be just fine. One thing nice about it being thin...it was easy to install a weldless ball valve kit. I use this kettle for some smaller batches and it works well. Thin walls and not great long term hold up I anticipate but good for the price.